The Sunshine State lives up to its name and affords residents from all over Florida to enjoy bicycle rides, whether they are leisurely paces along the coasts, intense group rides for the more serious riders, or just an alternative form of transportation. However, along with all that fun comes a little danger, too – especially when motor vehicles are involved. 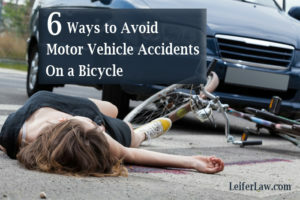 Fortunately, some motor vehicle and bicycle accidents are preventable. Below are six steps you can take to avoid a bicycle accident with a motor vehicle. Check your bicycle’s basic equipment such as seat adjustment and position, tire pressure, and reflector lights. Basket or Saddle: To carry items (such as those listed below) and prevent you from riding with just one hand. Water Bottle Holder: Again, to prevent you from riding one-handed. Repair Kit: To make any necessary repairs along your trip. Bike Pump: Riding on an under-inflated flat tire is dangerous for both you and your bike! Mirrors: Consider adding mirrors on either side of your handlebars so you’ll know what’s behind you without having to turn around to look. Make sure motor vehicle drivers can see you and your bike. Your bike should be equipped with reflector lights in the front and back, and you might want to install a small headlight for nighttime riding (any basic bike shop carries this equipment). Also, wear reflective clothing such as bright, neon colors, or go all out and wear reflective tape on your shirt when riding at night. It’s better to be safe than sorry! Check out Florida’s bicycle statutes for information about special equipment for carrying children as passengers; riding in lanes designated for bicycles; operating on one-way highways; and more. Keep an eye out for debris, road work equipment, potholes, and other road hazards that could cause both motor vehicle and bicycle accidents. Ride in such a way that a motor vehicle driver can predict your moves. For example, don’t bob and weave through traffic or switch from the sidewalk to the road; stay on your side of the street and give signals when you’re making a turn. Alright, so wearing property bicycle safety gear might not prevent bicycle accidents with motor vehicles, but the gear definitely can help keep you safe during one – maybe even alive. In Florida, anyone younger than 16 years old must wear a properly fitting helmet, but bicyclists of all ages should protect their heads. No matter how many safety precautions you take, accidents happen. After all, you can’t control a motor vehicle driver’s actions; you can only control your own. If you’ve been the victim of a bicycle accident involving a motor vehicle, contact South Florida Leifer Law Firm right away. We’ll schedule a free consultation to discuss the details of your accident and how we can move forward to make sure you get the compensation you deserve. Call us at (561) 395-8055 or contact us online today.